New York (AFP) - LeBron James and his new Los Angeles Lakers teammates will visit defending champion Golden State on Christmas in a 2018-19 NBA campaign that opens October 16, the league announced Wednesday. James has faced the Warriors in the NBA Finals the past four years as a member of the Cleveland Cavaliers, winning the 2016 crown. But the four-time NBA Most Valuable Player left the Cavs and signed last month with the Lakers. 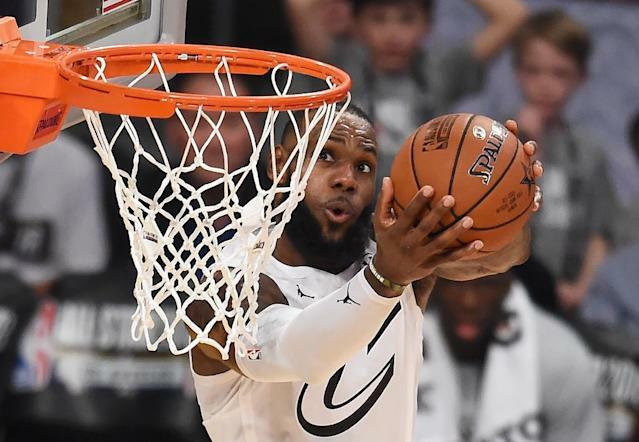 The NBA announced dates for several high-profile games ahead of releasing the full schedule for its 73rd season on Friday. The league will stage its earliest opening to a season since the 1980-81 campaign began on October 10. The Philadelphia 76ers will visit the Boston Celtics and the Oklahoma City Thunder will visit the Warriors on October 16 to tip-off the season. Golden State players will receive championship rings and unfurl their latest title banner before the contest. The next night, NBA Most Valuable Player James Harden and the Houston Rockets will host the New Orleans Pelicans while the Dallas Mavericks will visit Phoenix in a game featuring NBA Draft top pick Deandre Ayton, a Bahamian 7-footer (2.16m) for the Suns and third overall selection Luka Doncic, a 19-year-old Slovenian swingman, for Dallas. On October 18, James makes his NBA regular-season debut with the Lakers when they visit Portland. On the same night the Chicago Bulls will visit Philadelphia. The next night features Boston at Toronto in a matchup of last season's top Eastern Conference regular-season clubs and the Warriors visiting the Utah Jazz. On October 20, James will play his first home game with the Lakers when Harden and the Rockets visit while Washington will entertain Toronto. The next night will see the Rockets stay in Los Angeles to face the host Clippers. Five games will be played on Christmas for the 11th consecutive year, including Milwaukee at New York, Oklahoma City at Houston, Philadelphia at Boston, Portland at Utah and the Lakers at Golden State. Three games were announced for January 21, the Martin Luther King Jr. Day holiday, with New Orleans at Memphis, Houston at Philadelphia and the Warriors visiting James and the Lakers in Los Angeles.